Our love and appreciation for the Italian hair care line Davines runs deep. 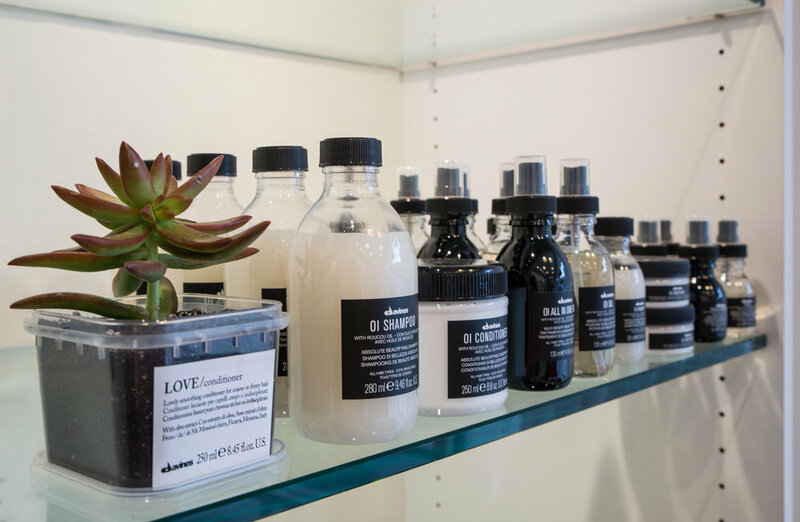 Stop in and shop our Davines collection- we'll tailor a cocktail of products perfectly suited to your hair type and styling needs. Buy any two Davines products and receive a free travel size Oi Milk or Oi Body Kit while supplies last! Though this winter season seems to be never-ending, luckily spring and summer are just around the corner! During these upcoming months, the heat and humidity can take it's toll on our hair. causing extra damage and frizziness. Between our everyday routines, beach vacations, and more our hair could use a little extra TLC this time of year. Thankfully, Goldwell's Kerasilk Keratin Smoothing treatment can take care of just that! Goldwell prides themselves on their exclusive Kerasilk with Keratransform Technology (KT3), a result of their latest research which fuses three powerful ingredients together technologies,to ensure long-lasting transformations. The first two ingredients, Keratin and lightweight silk, aid in structural support and color protection - the foundation for all Kerasilk formulas. Inspired by skin care science, the third ingredient delivers specialized results specific to each Kerasilk segment. A FORMALDEHYDE FREE service, this treatment offers smooth, manageable hair for up to 3 - 5 months, which is the foundation for beauty, strength, and protection! Another wonderful benefit the Smoothing treatment has to offer, is that it is FORMALDEHYDE FREE! For those of us with long, unruly, or color-treated hair (or just busy schedules), shampooing can be tedious and can cause more trouble than good. On good hair days, why shampoo away all your hard work? Keep you perfect 'do looking fresh and feeling clean by using dry shampoo. 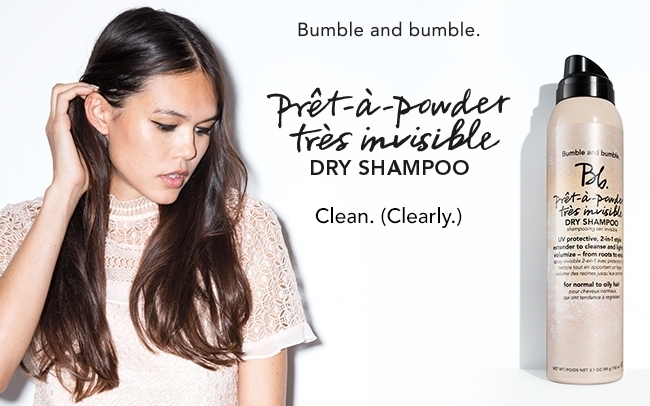 Bumble and bumble's signature dry shampoo, Prêt-à-Powder, has long been a dry hair cleanser, volumizer, & texturizer all in one super light-weight powder. Prêt-à-Powder revives second-day styles, absorbing oils at the root. The bottle is shaken over hair from roots to ends, ensuring total cleaning coverage. Nevertheless, sprinkling the powder over hair without mess can be a challenge, and takes some technique. Bumble and bumble is no stranger to innovation. They've expanded the Prêt-à-Powder family to now include two new versions of their classic dry shampoo! We're ecstatic that they will now be sold in spray form- providing the same benefits without the mess! Stretch your style from yesterday with instant cleansing and volumizing dry shampoo spray. Prêt-à-Powder Trés Invisible spray is just like the OG powder, leaving strands lightly scented with a just-washed clean feeling. Perfect when on-the-go, just spray into hair and work from roots to ends. Et voila! No white residue, no mess! Our favorite upgrade to the Prêt-à-Powder family: for some of us, dry shampoo can almost be too drying. Bumble's Trés Invisible Nourishing is infused with hibiscus oil, so dry and damaged hair types get the full cleansing benefit, without sacrificing soft ends, texture, and shine. UV filters in both sprays prevent any further damage from the drying effects of the sun. Make great hair days last till tomorrow! All Prêt-à-Powder installments come in large and travel sizes. Stop by and pick up one today! Looking for a product to cover your grays in between salon appointments? Bumble and bumble has got you covered...literally, with the NEW Bb Color Sticks! Bb Color Sticks are a velvety, pigmented pencil that adds color wherever you need it. The NEW Color Sticks are an opaque, water-resistant product that won't budge! The Color Stick collection features 5 shades that instantly covers grays, refresh roots, and fill in sparse areas. Perfect for those who want to extend time between appointments or those whose hair is thinning. Shades include Blonde, Dark Blonde, Red, Brown, and Black. Apply these Color Sticks like a lipstick and blend with ease with just your fingers, no tools needed! Bb. Color Stick is applied to dry hair after styling. For best results, always use Bb. Color Stick as the last step in your styling routine. Since Bb. Color Stick doesn't alter the color of your hair, its safe to leave it on until your next shampoo. Depending on how often you wash, you may need to touch up as needed. We are so excited for these to launch we can barely stand it!